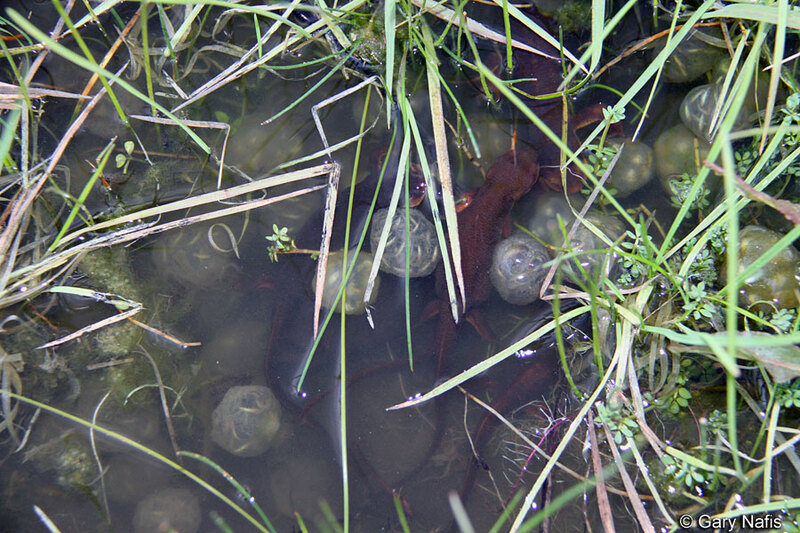 Several males competing for a female that is somewhere in the middle of the mass. 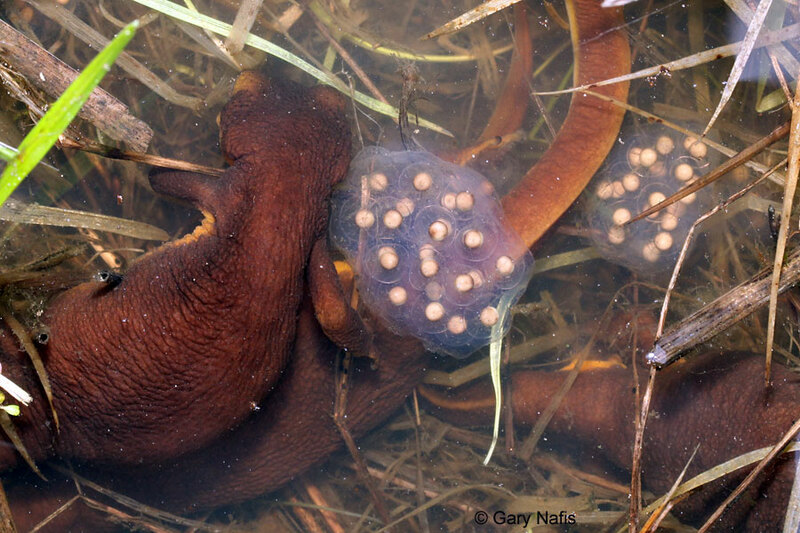 This was early in the breeding season when most newts in the pond were males. 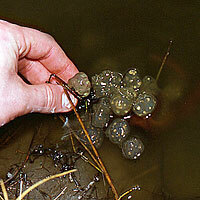 (Multiple amplexus, or mating balls, where numerous males surround one female can cause the death of the female by drowning.) 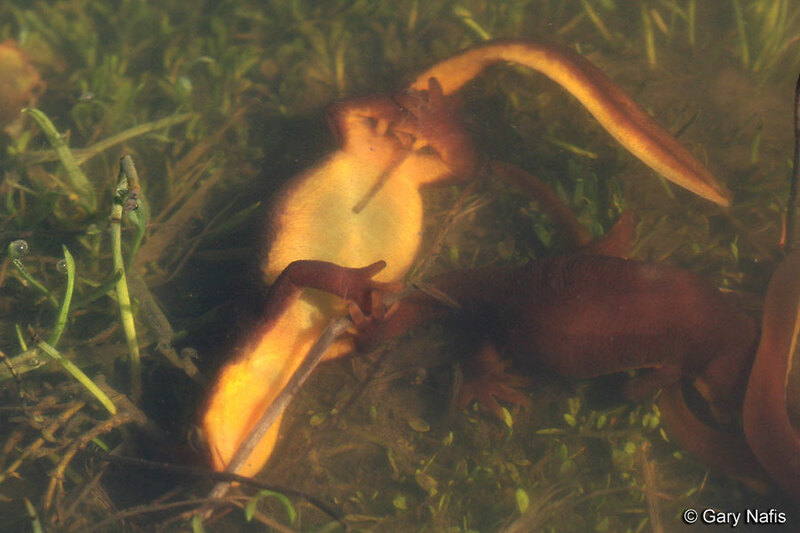 Male (on top) female in amplexus During the breeding season, adult males develop nuptial pads on the toes to improve their ability to hold onto females during amplexus. 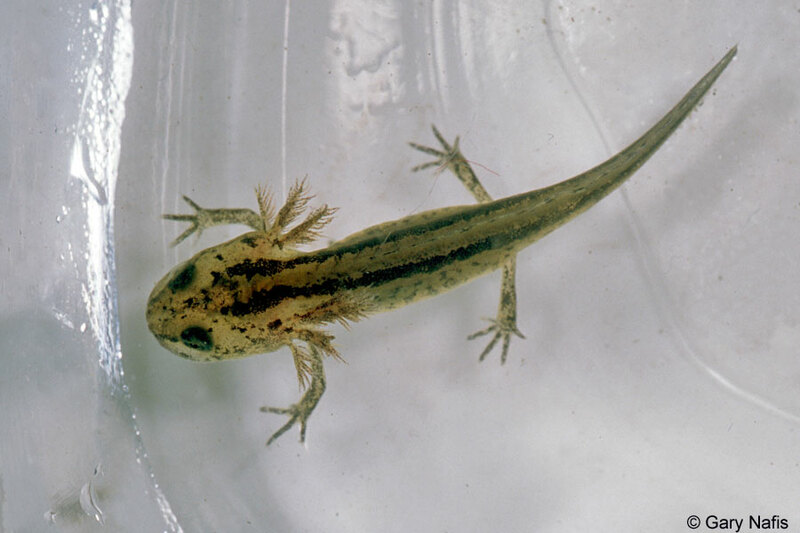 Compare to the toes of a breeding female without nuptial pads. 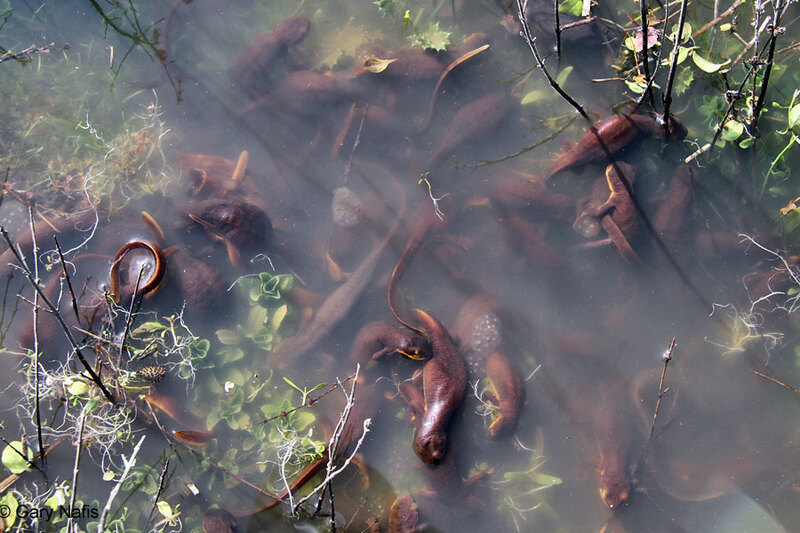 These are some of hundreds of adult male newts that I watched one winter afternoon as they migrated up a small drainage to a breeding pond, slowly crawling against the current of water flowing from the pond through a small pipe. 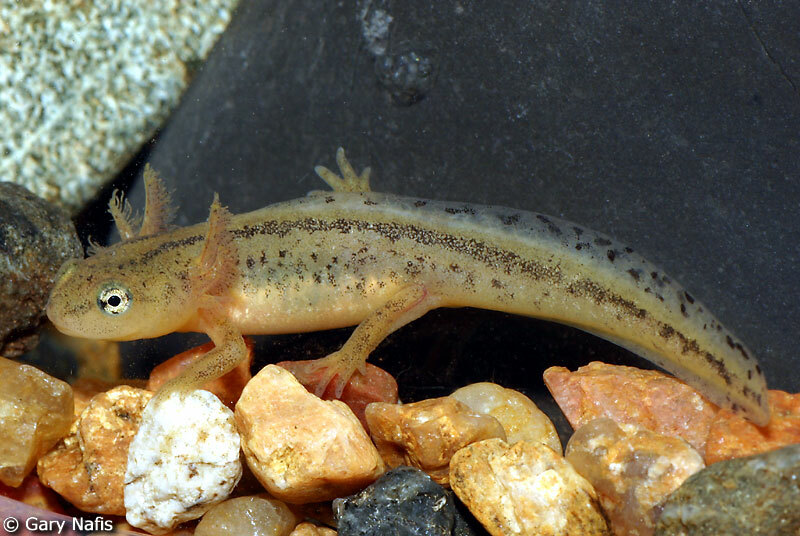 Their bodies have already undergone the change to their aquatic form, with smooth loose skin and broad flattened tails for swimming. 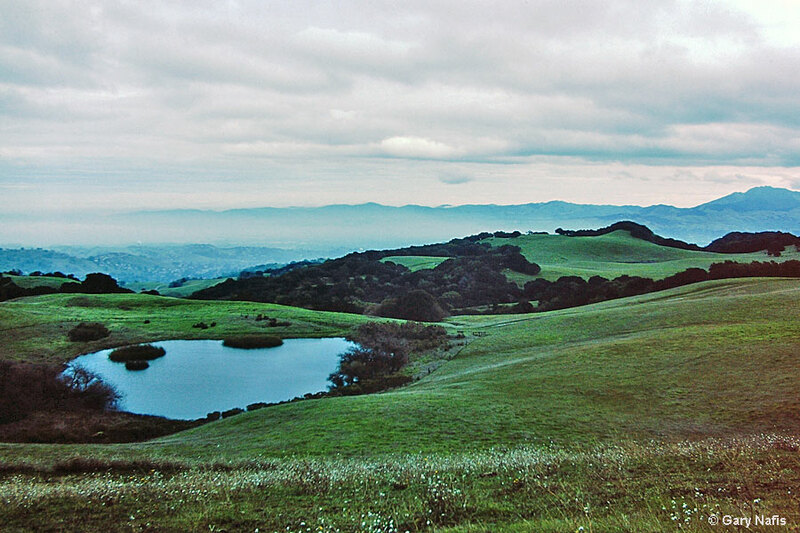 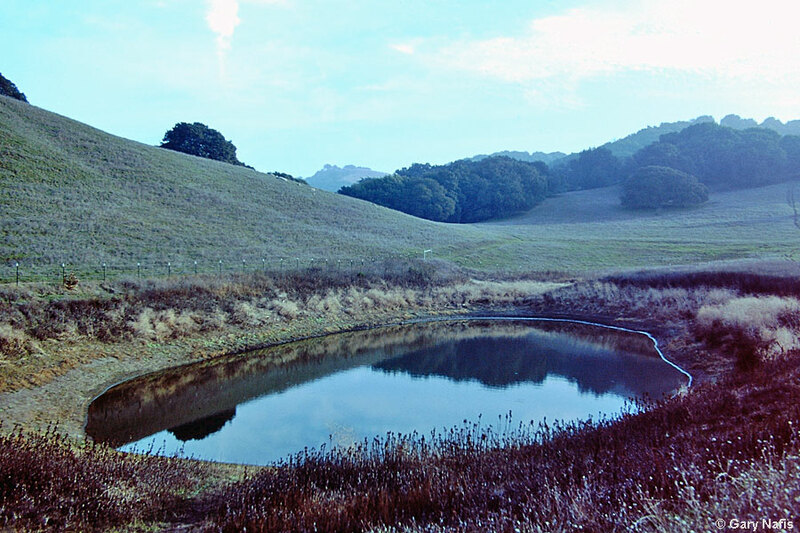 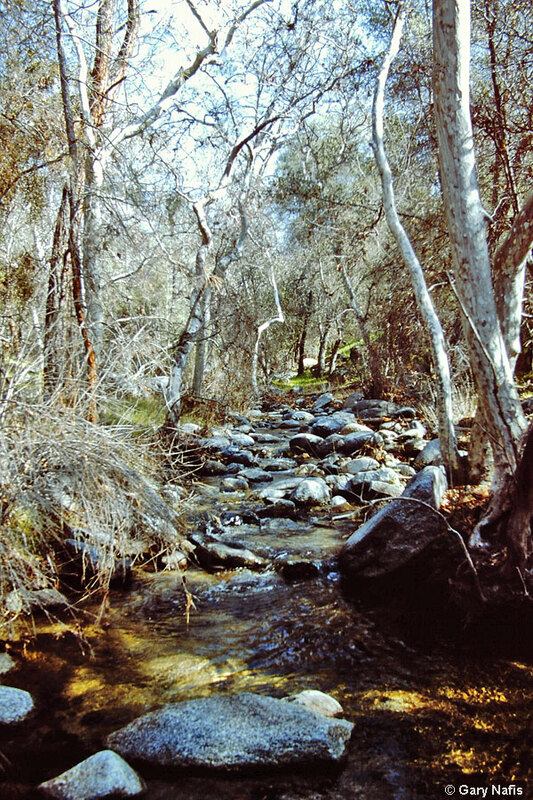 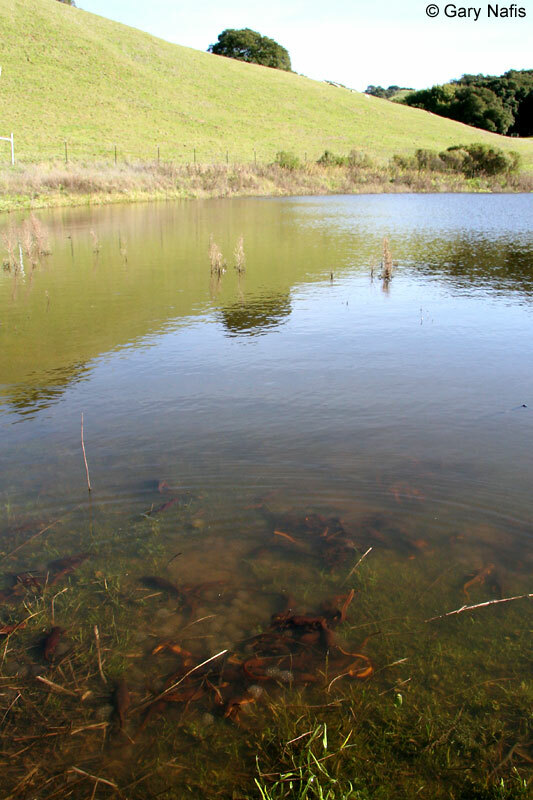 The pond and pipe are visible in the picture on the left. 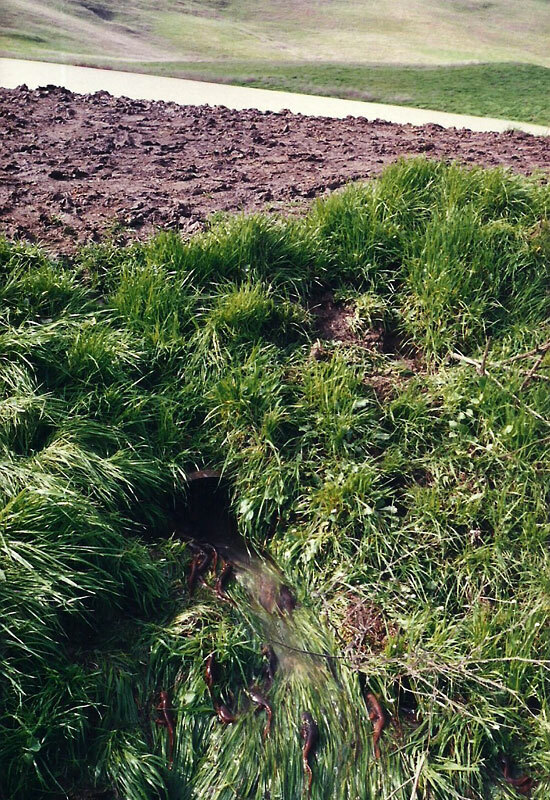 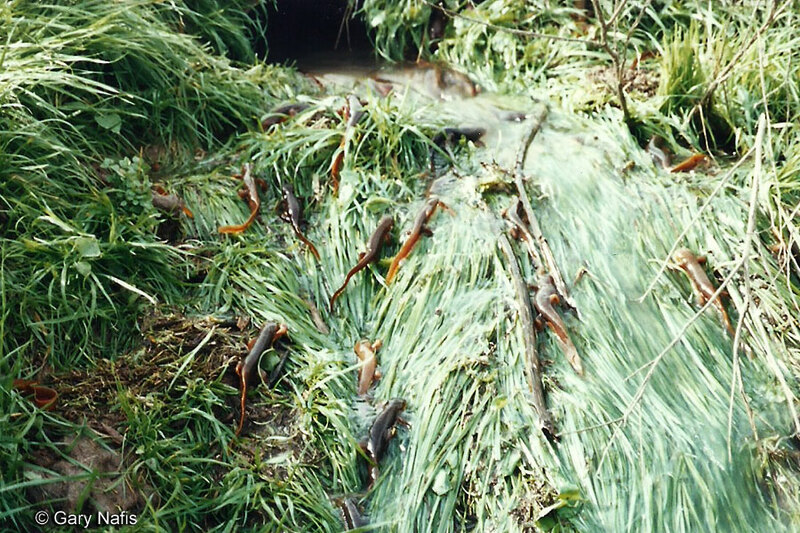 To the right of that, you can see a logjam of newts at the opening to the pipe. 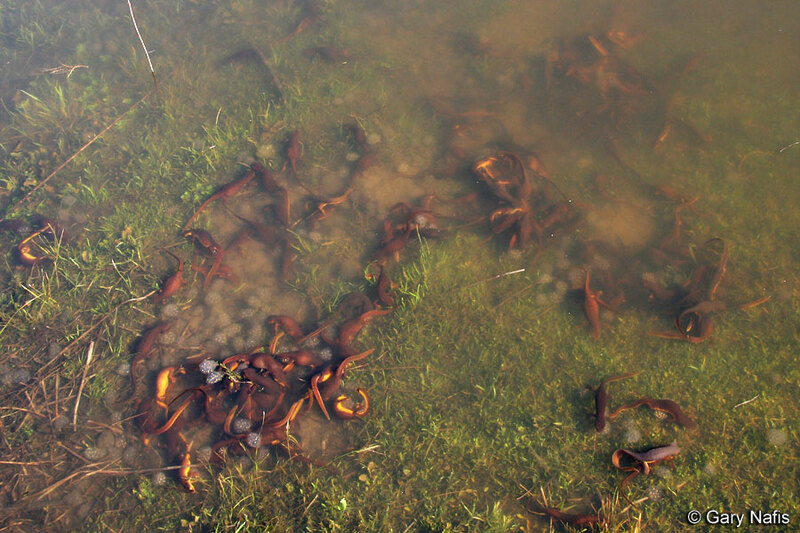 There may have been something in the water that made them keep forcing their way up it because they could have easily gone around the pipe and entered the pond in just a few minutes walk. 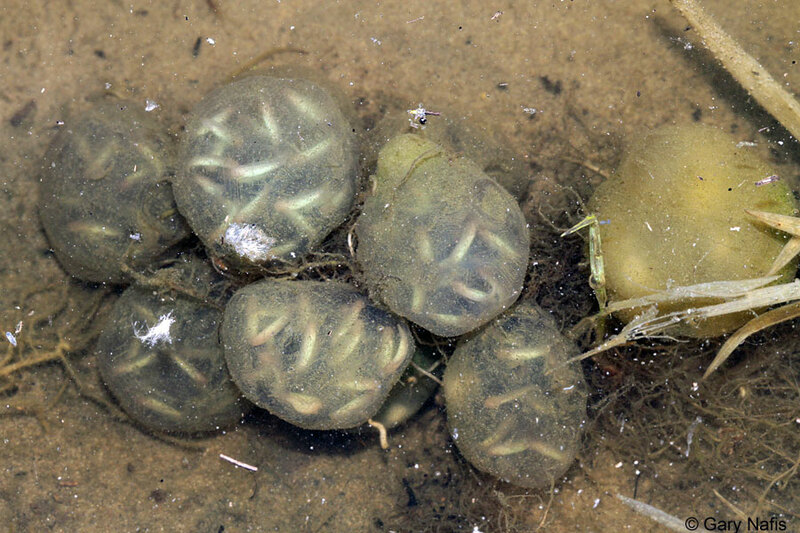 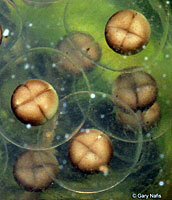 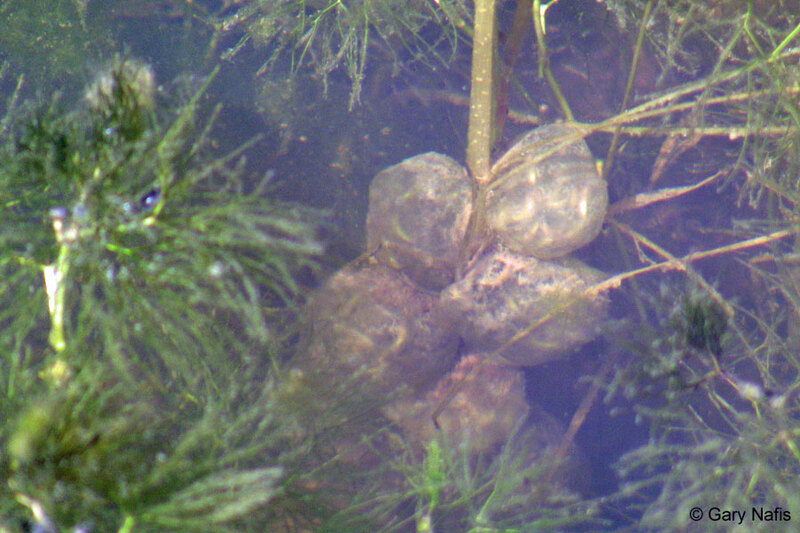 to underwater vegetation Eggs attached to a stem underwater. 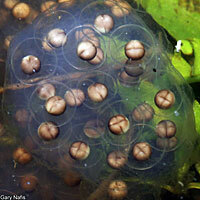 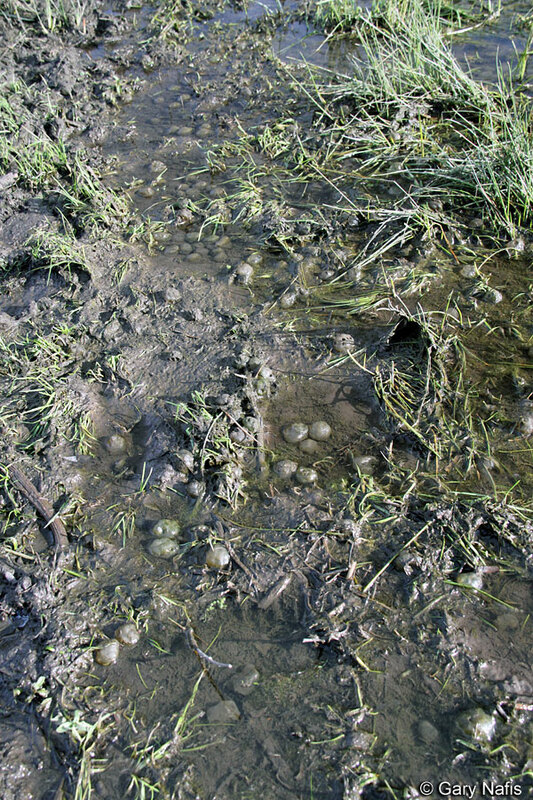 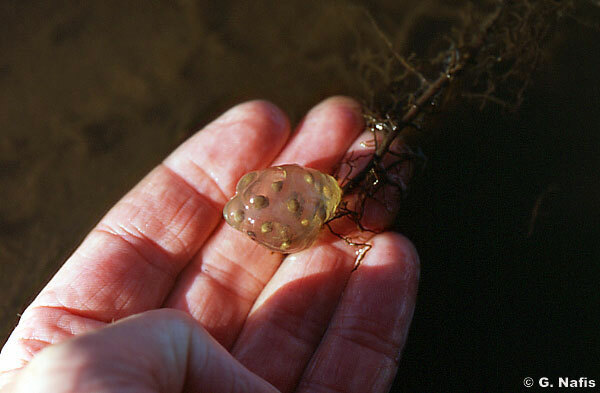 On the top left near the surface is a Sierran Treefrog egg mass. 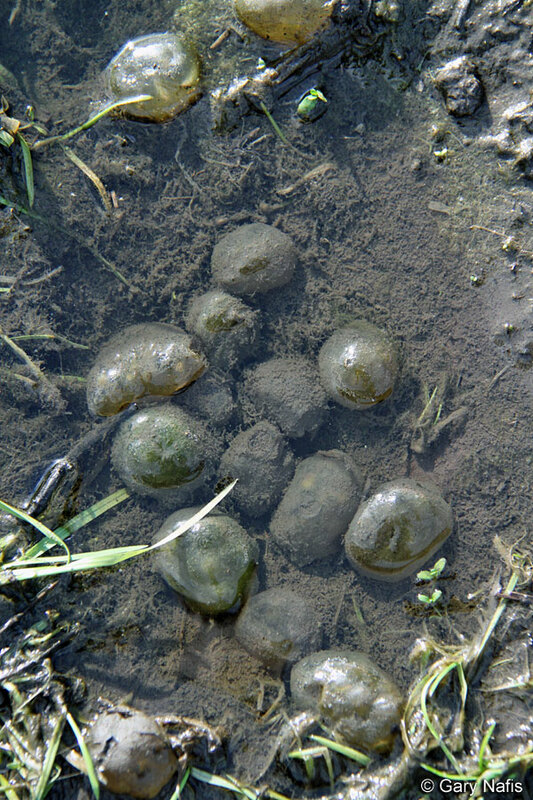 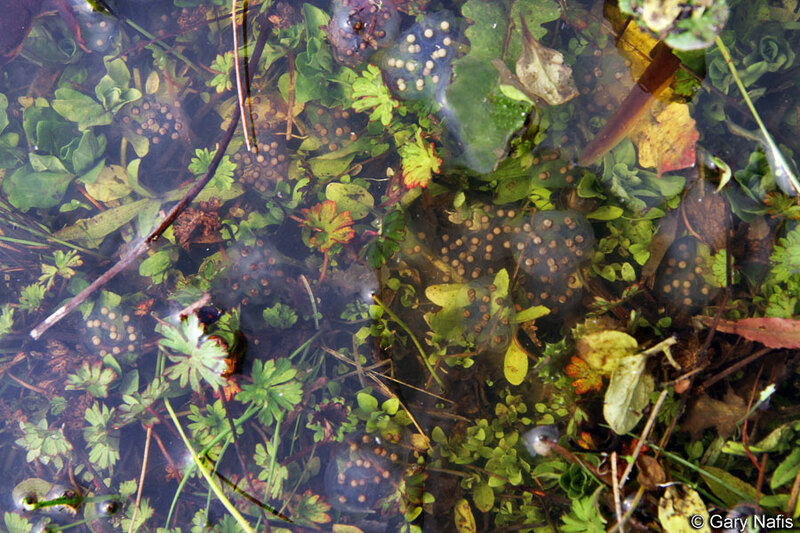 To the right and slightly below that is a California Newt egg mass. 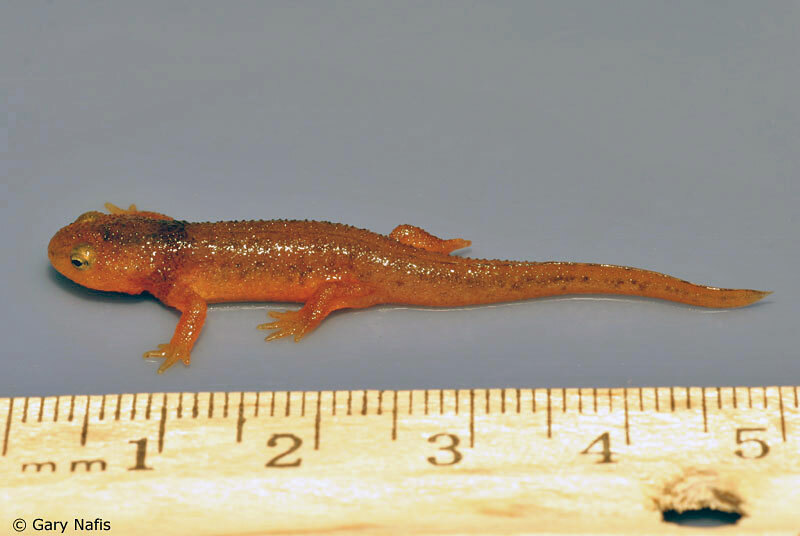 life stages, from an aquatic larva, to a tiny, fully-metamorphosed juvenile newt. 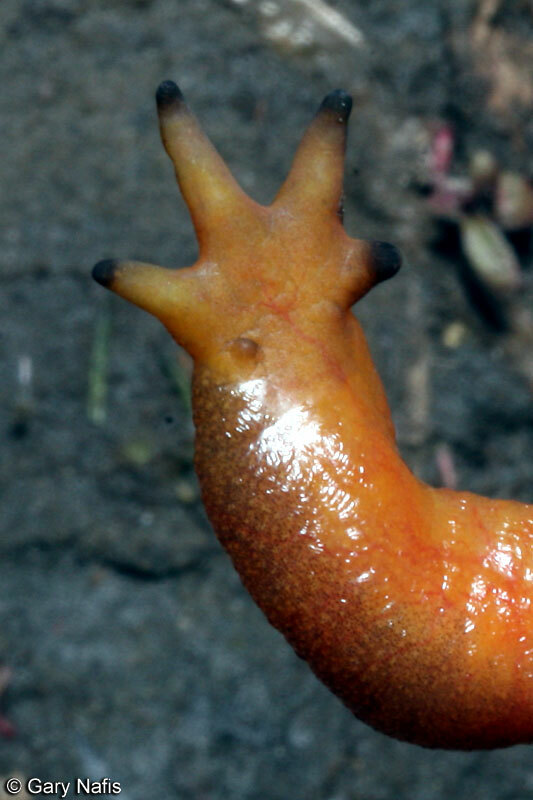 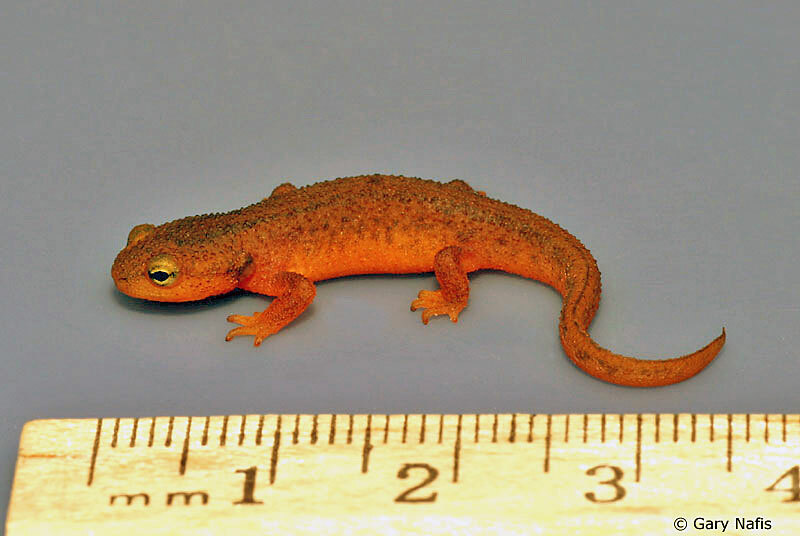 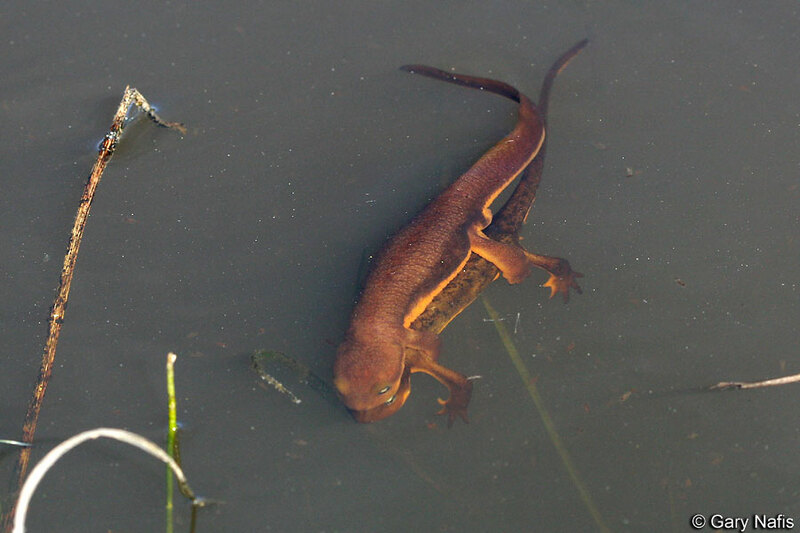 Larva in early August, developing the warty skin and orange coloring typical of adult newts. 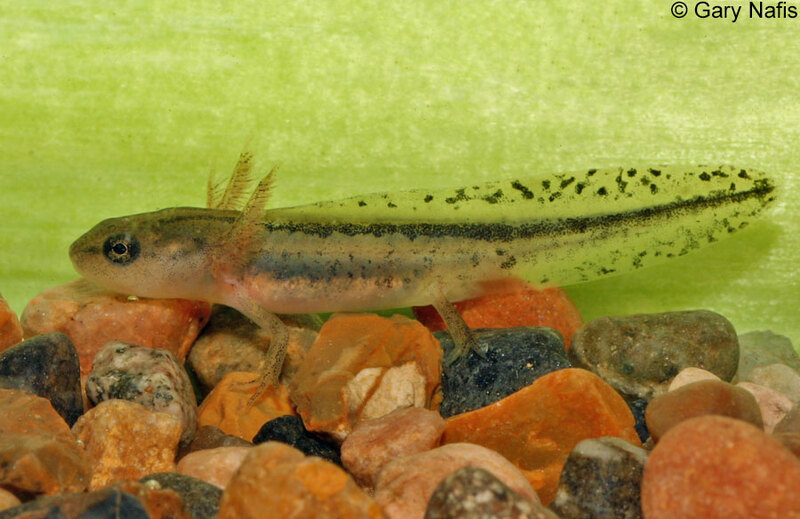 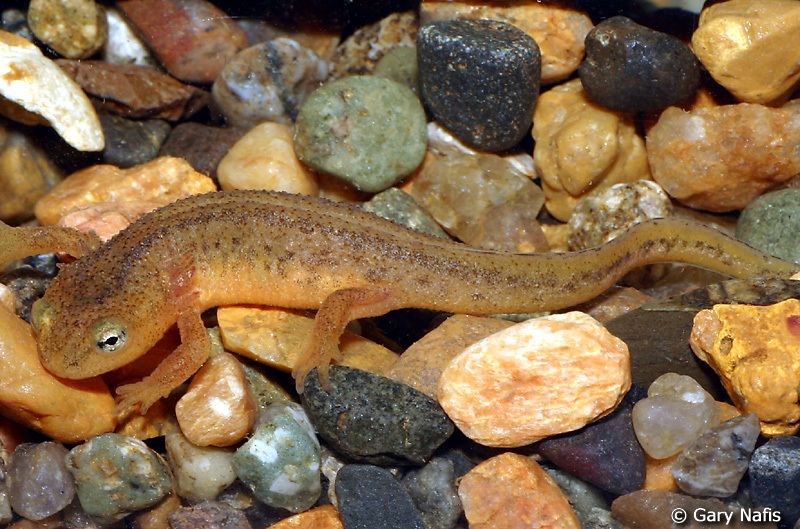 Still living in water, but showing reduced gills, preceding the transformation to breathing air. 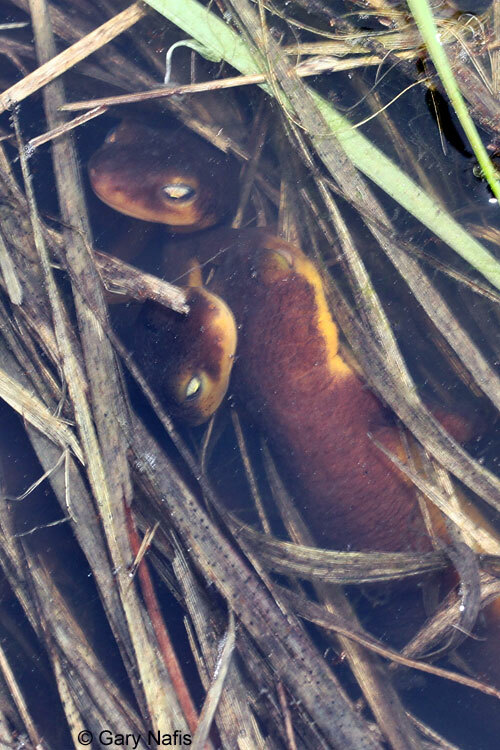 The newt is underwater in the left and center pictures and in the air in the right picture. 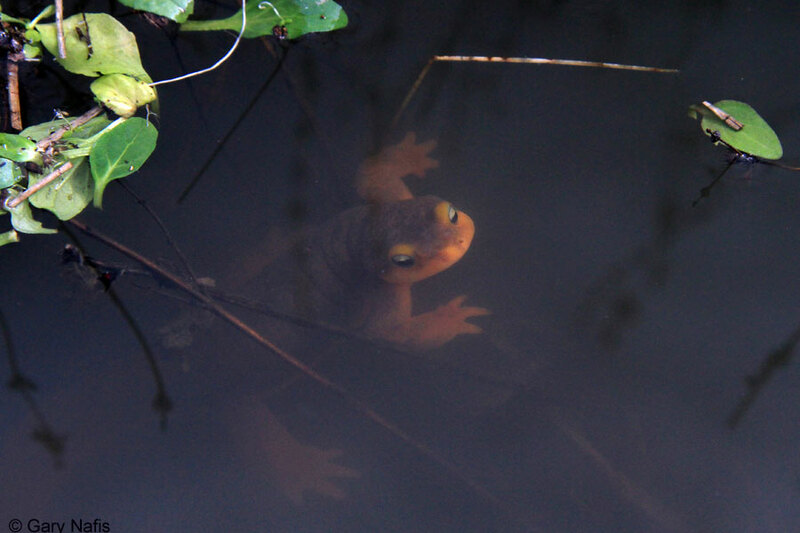 3 days later, the same newt out of the water. 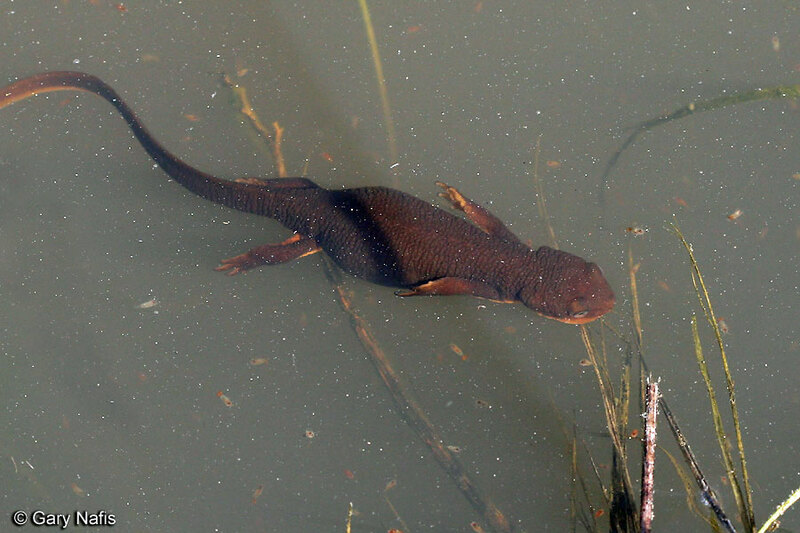 The newt is now coming up for air, but still living in water. 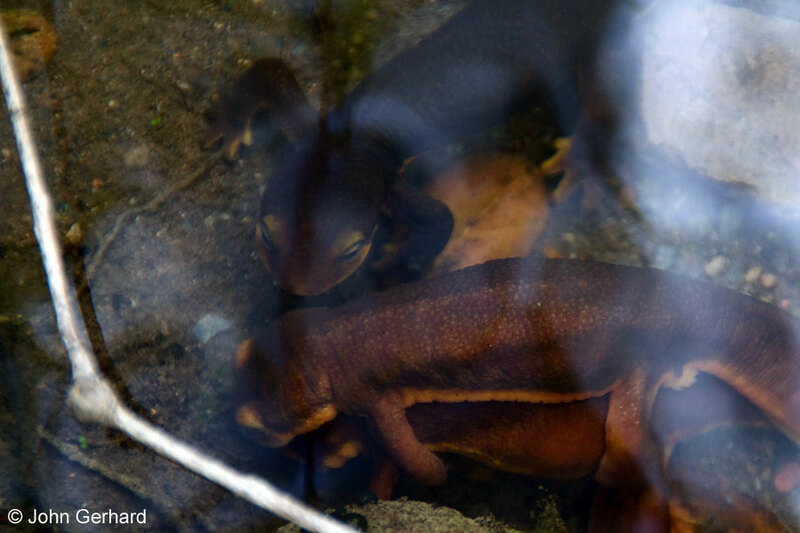 A tiny bit of the gills remain. 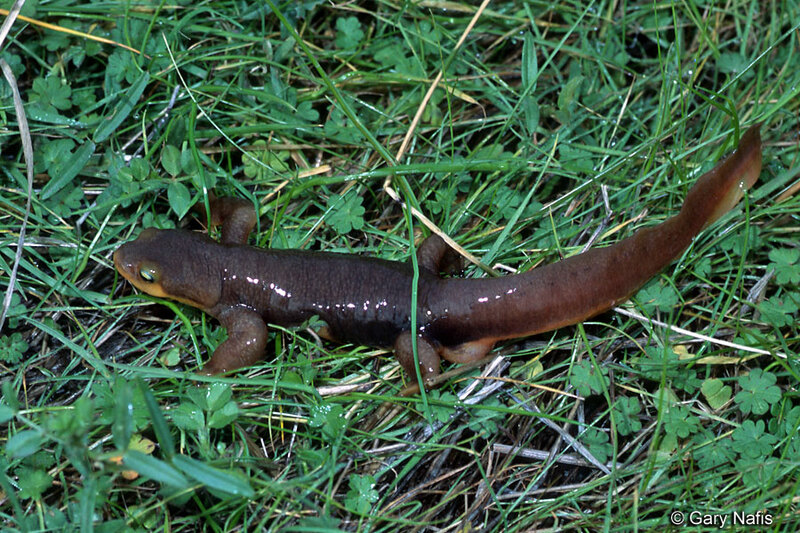 The dark band around the neck shows where the skin is shedding. 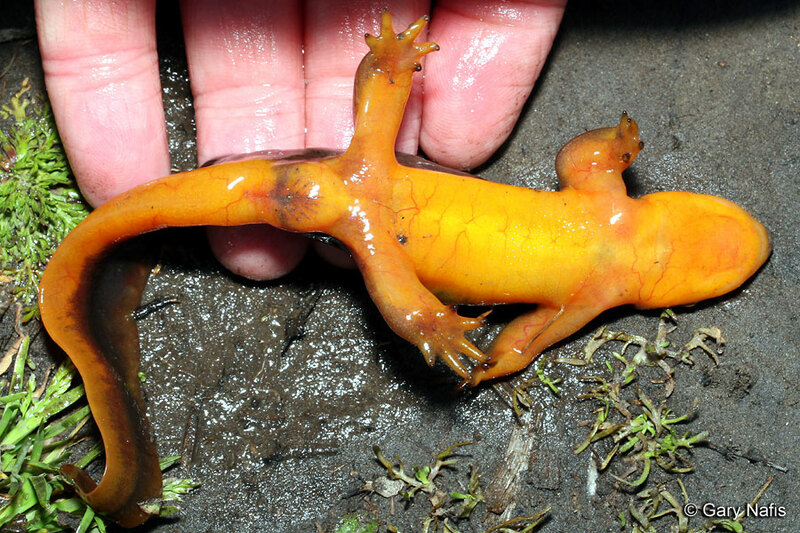 2 days later, the newt has just emerged onto land, breathing air. 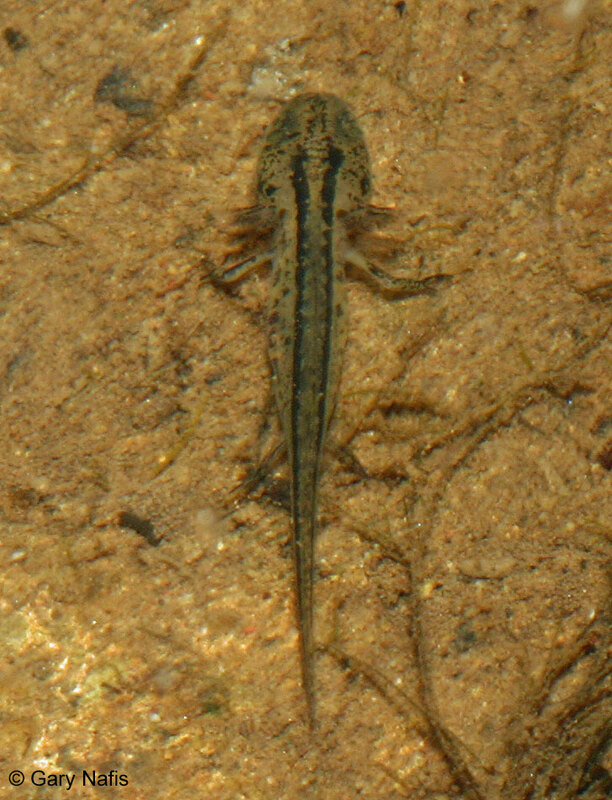 The skin is rough and still retains some of the dark larval markings. 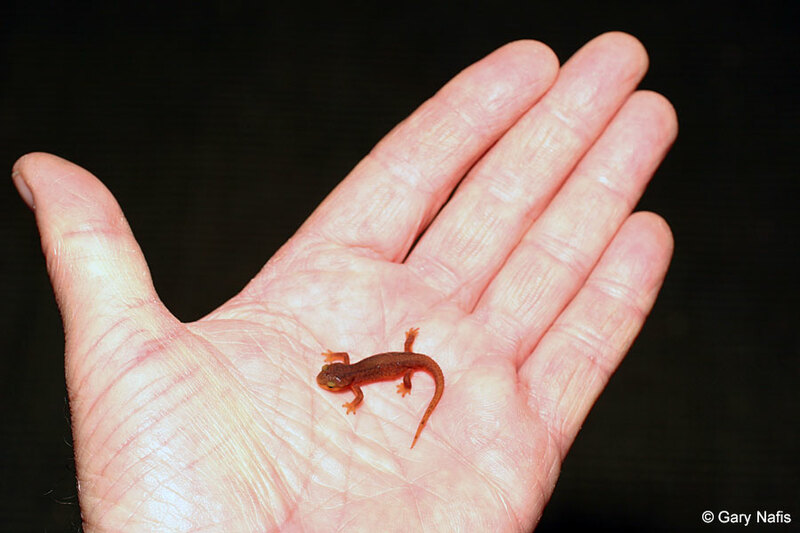 2 Weeks later, the newt is now fully terrestrial, but still very tiny. 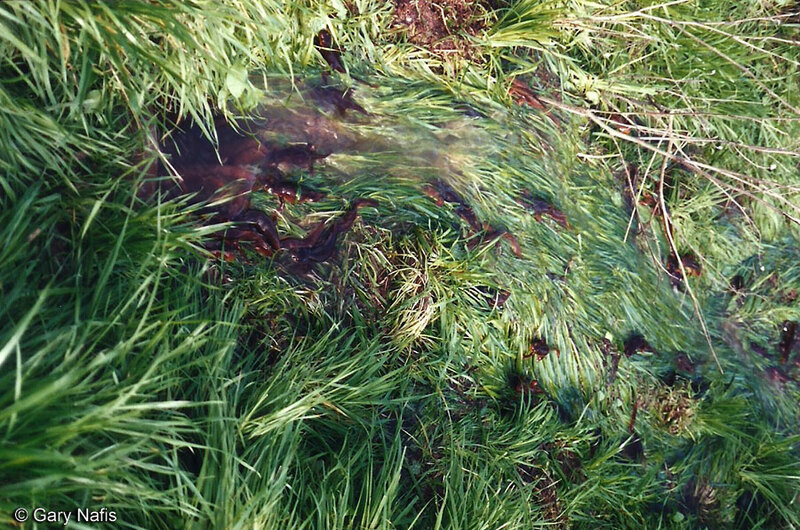 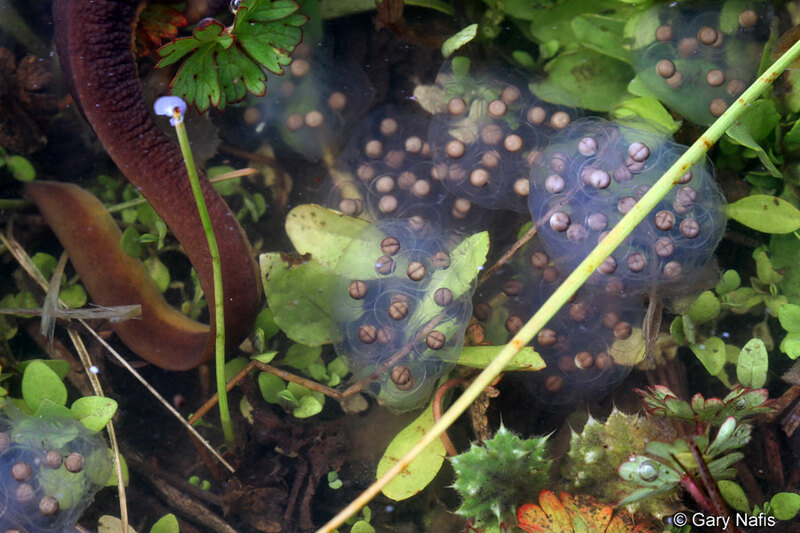 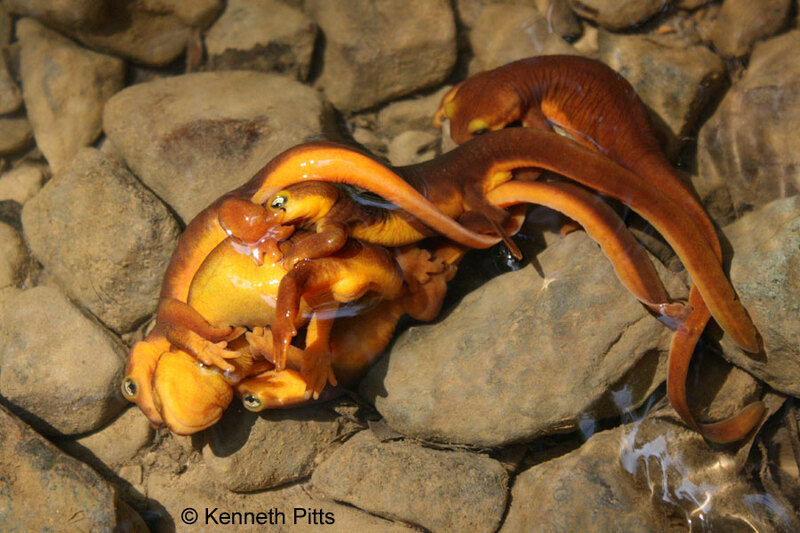 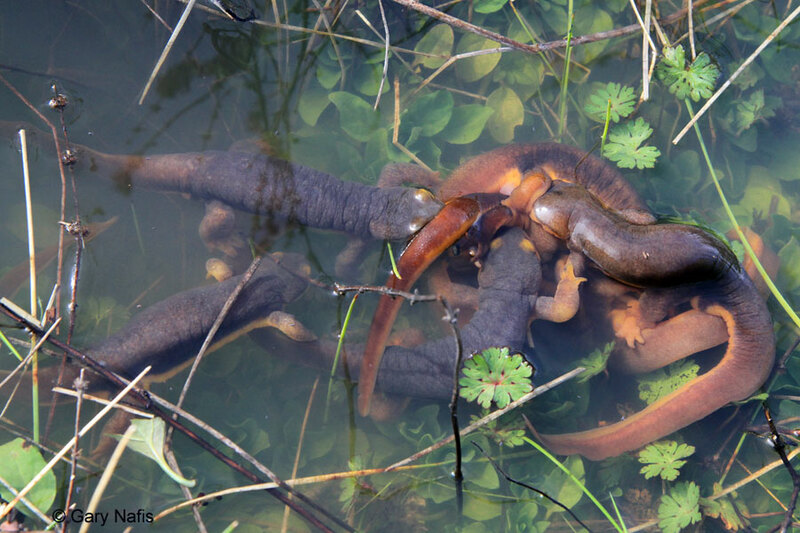 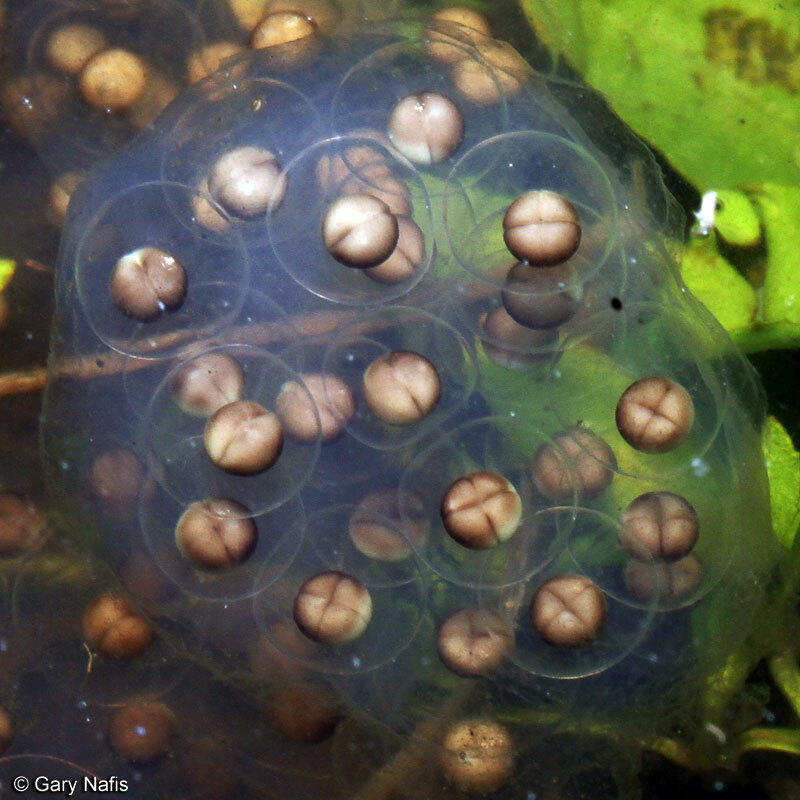 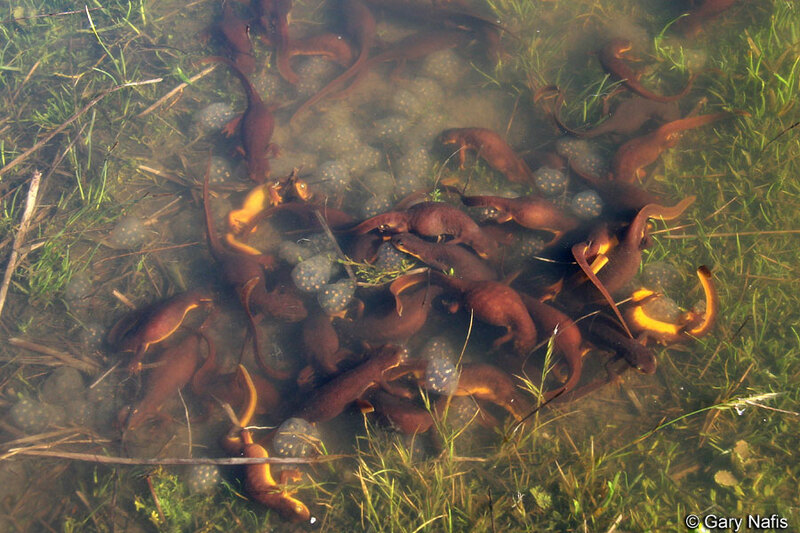 A big ball of newts forms in the breeding pond when a male and female in amplexus are approached by several male newts who want to take the female. 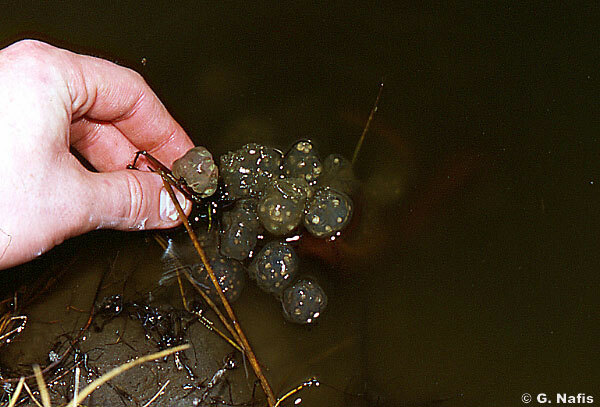 (Multiple amplexus, or mating balls, where numerous males surround one female can cause the death of the female by drowning.) 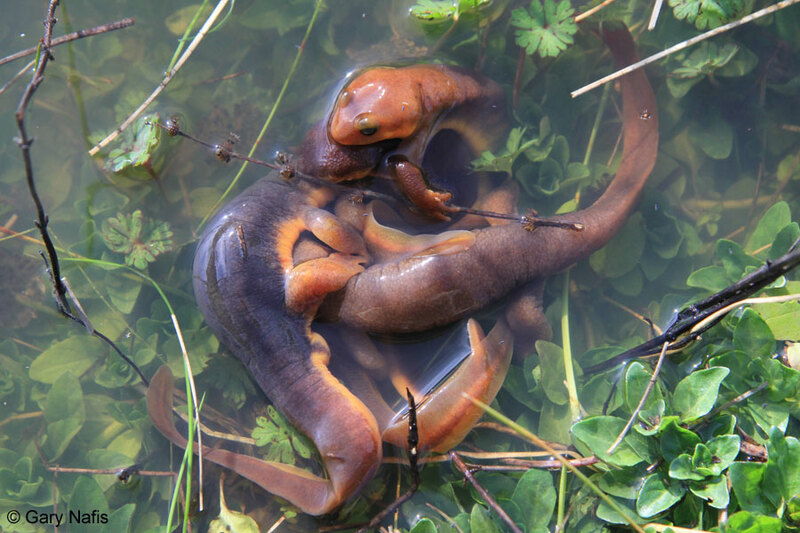 Male and female newts in amplexus in the breeding pond. 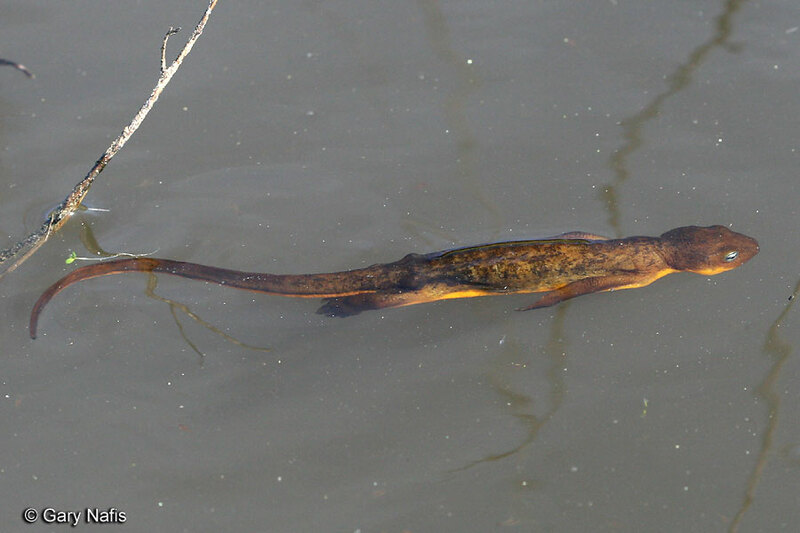 The males hold on tight and swim around the pond using their huge tails. 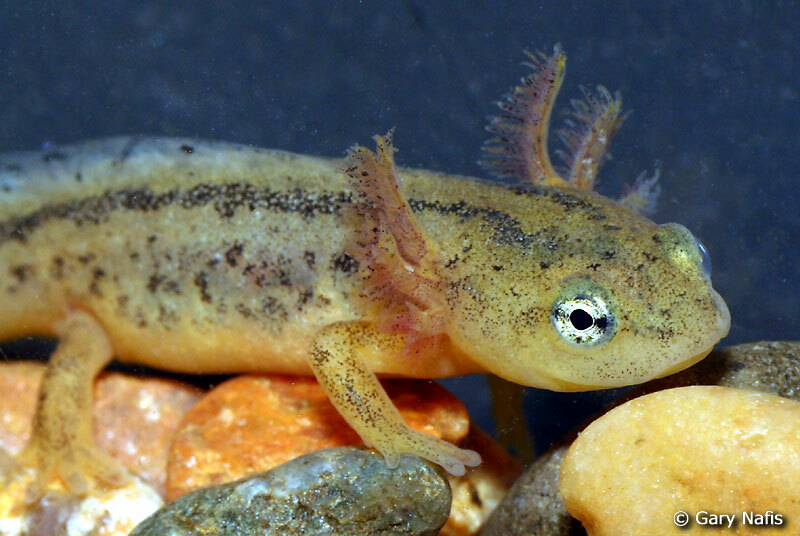 One uses the toes on his hind feet to stroke a female, probably to make her receptive to take his spermatophore. 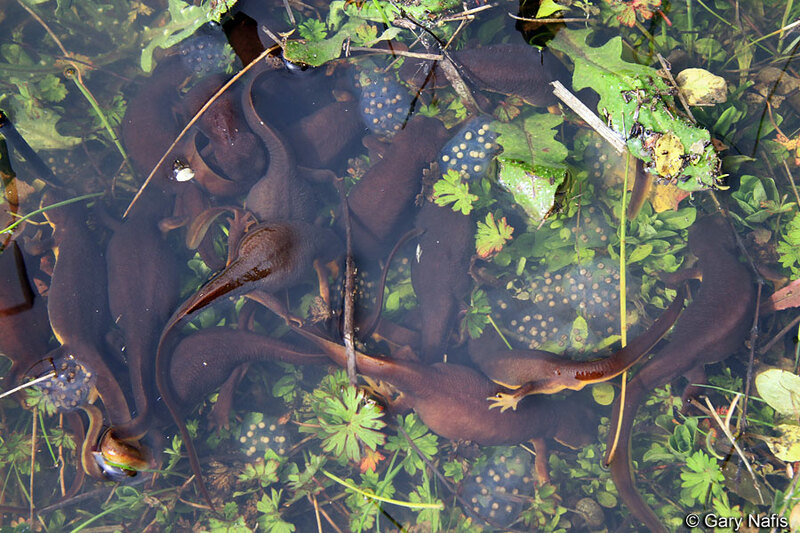 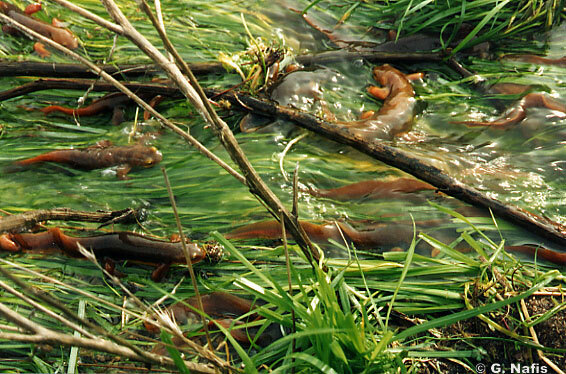 Views of a large mass of female newts in the breeding pond, as they go about laying and securing their eggs. 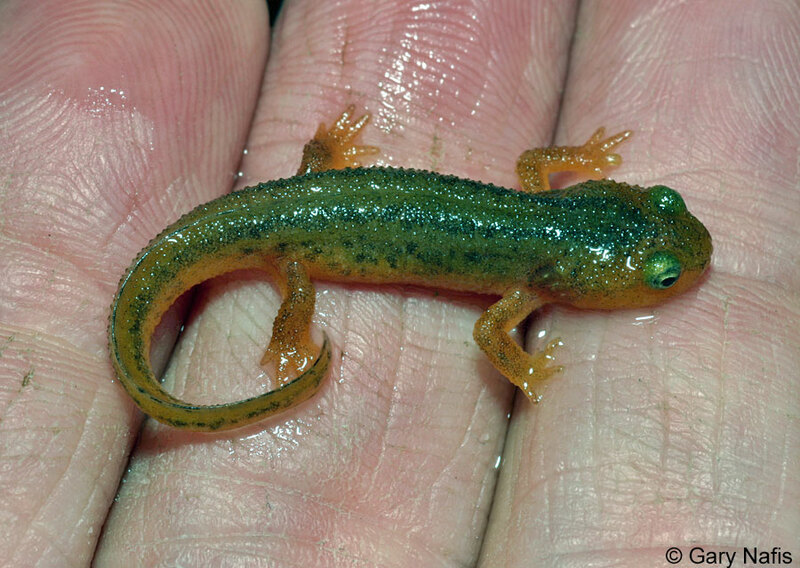 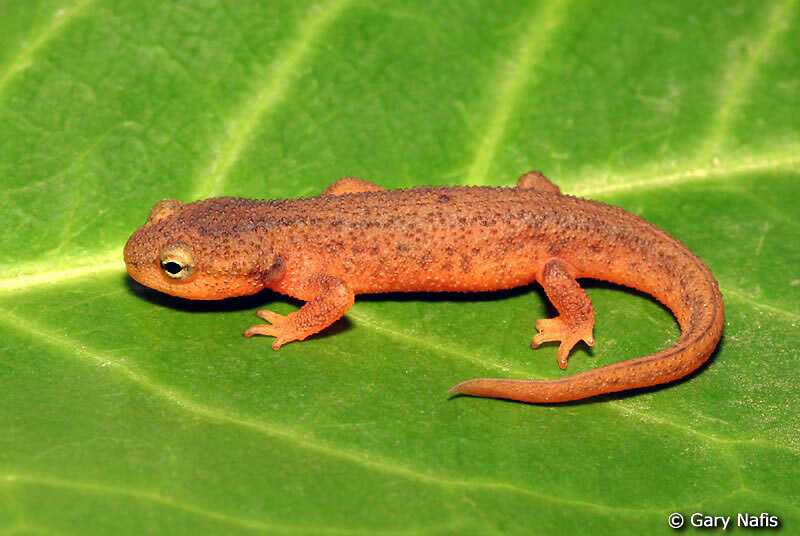 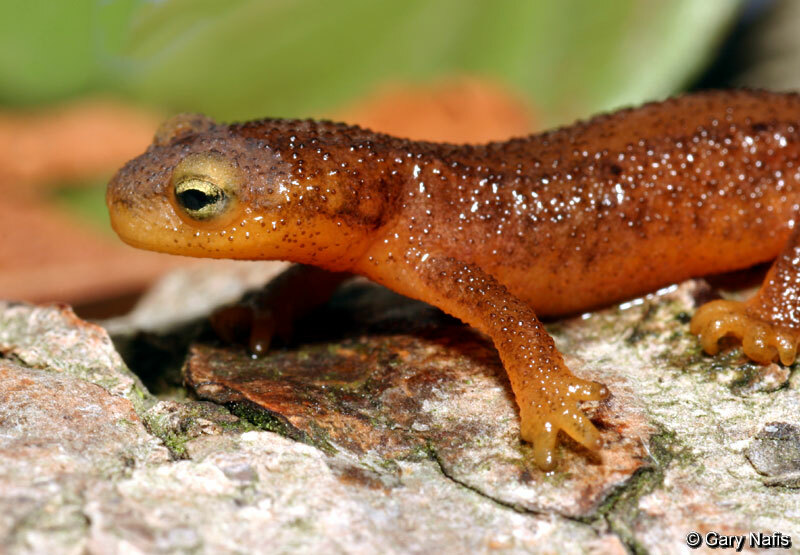 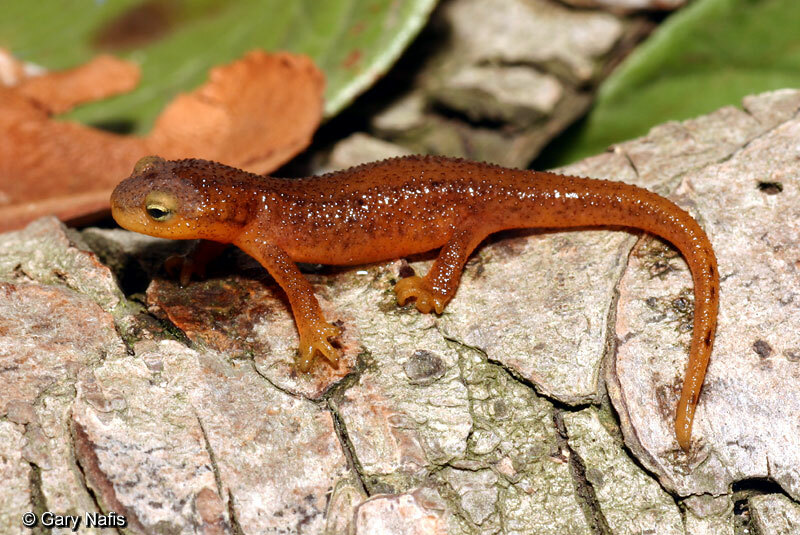 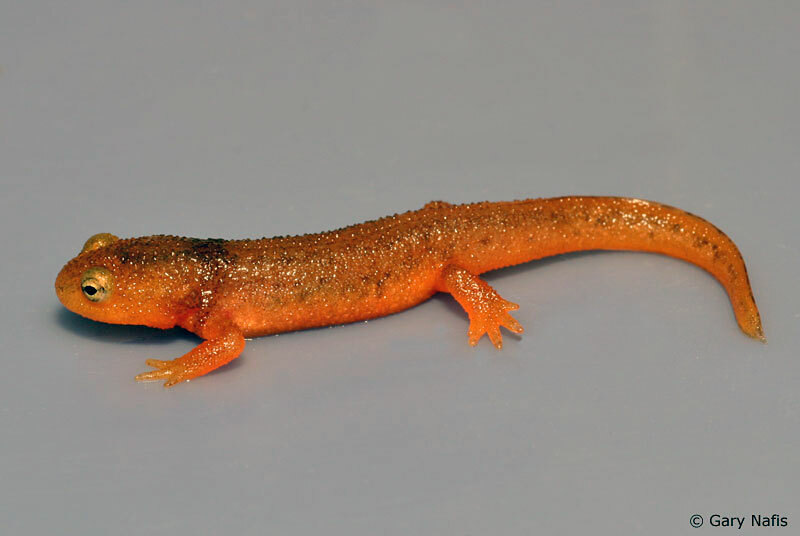 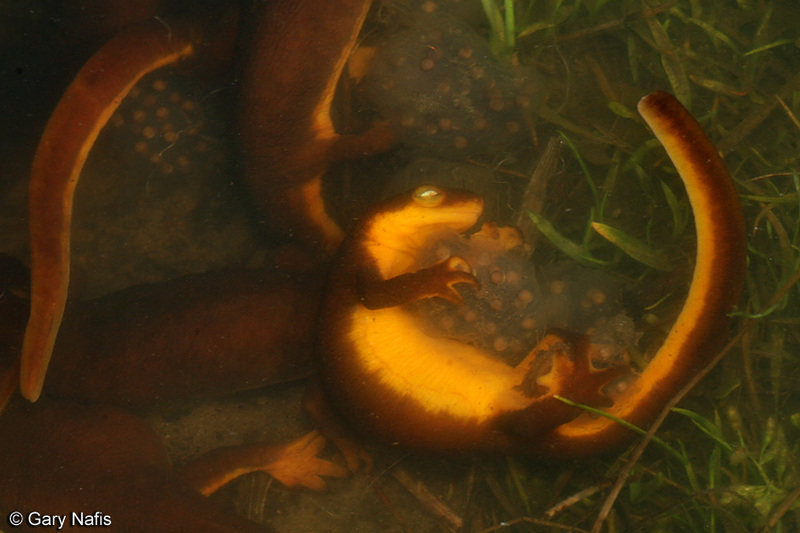 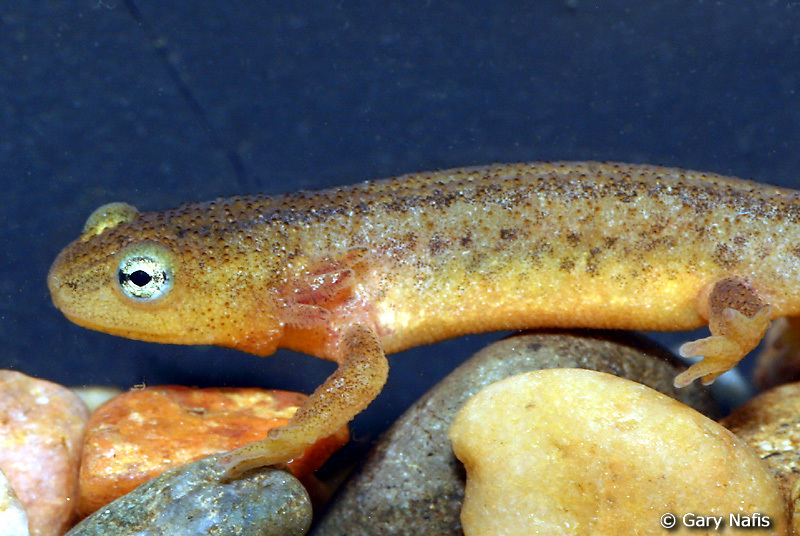 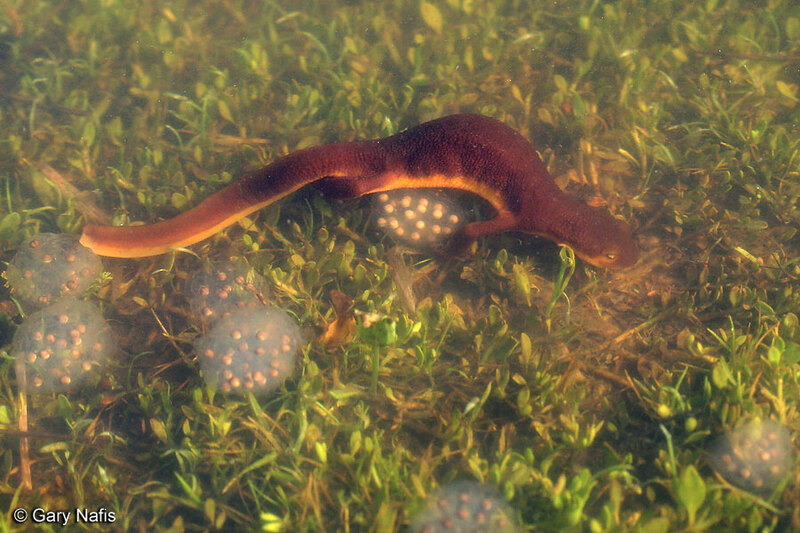 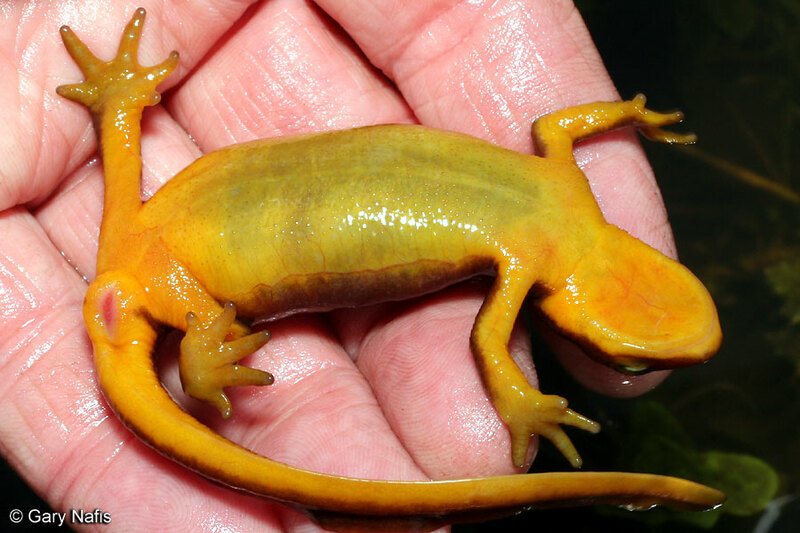 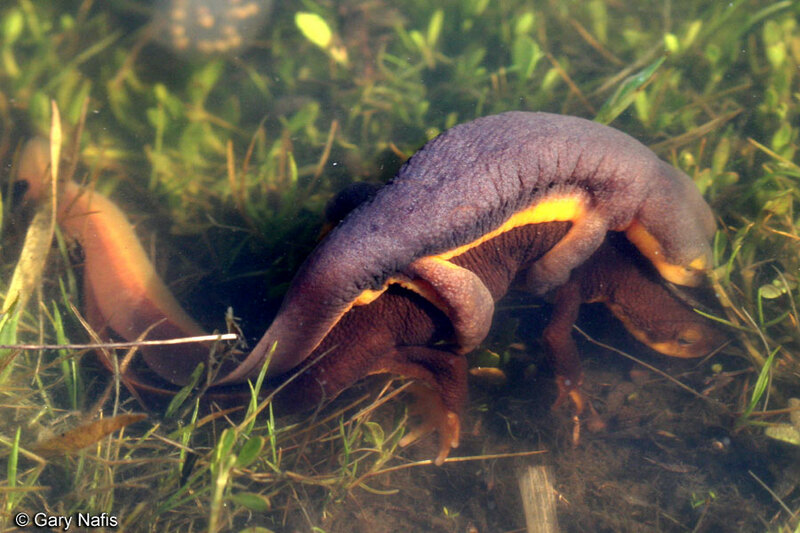 Female newts repeatedly attack and bite at newt egg sacs. 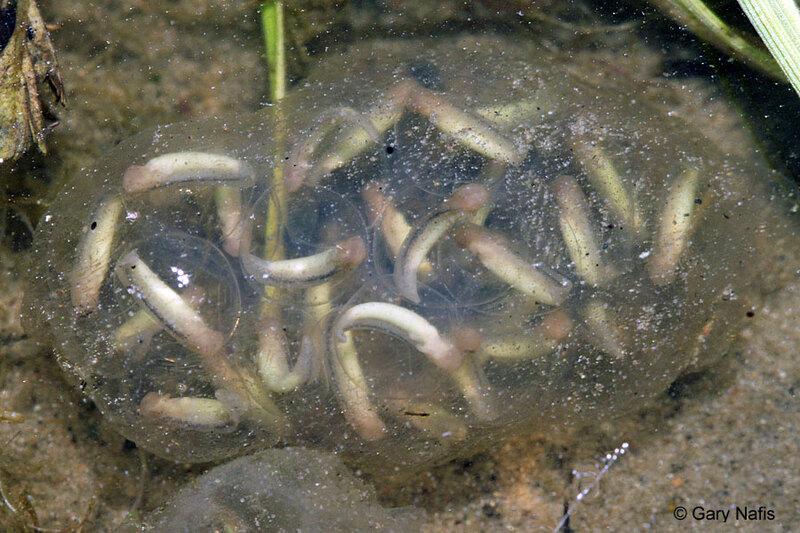 Maybe they want to destroy the eggs for some reason or they're trying to eat them, or maybe there is another explanation. 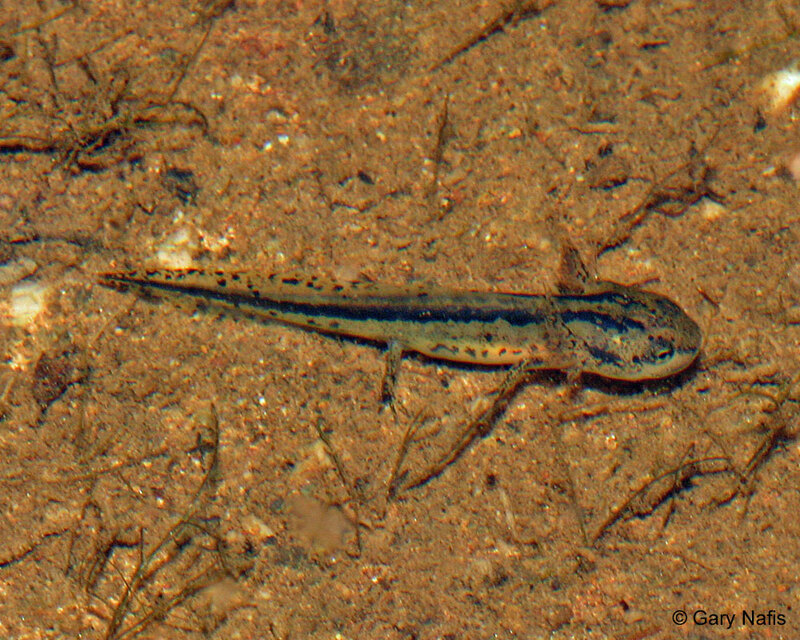 At the beginning of the breeding season we see single males patrolling the edge of the pond waiting for females to arrive, and females crawling overland and entering the water. 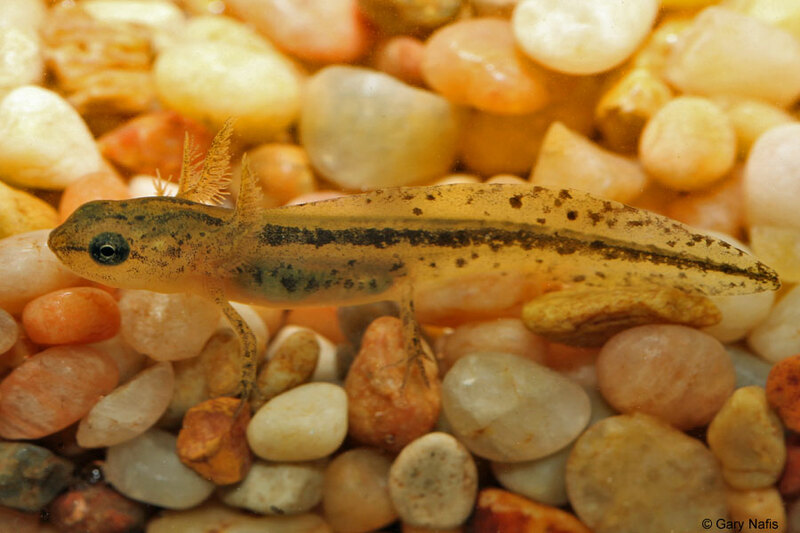 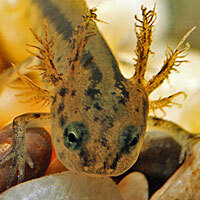 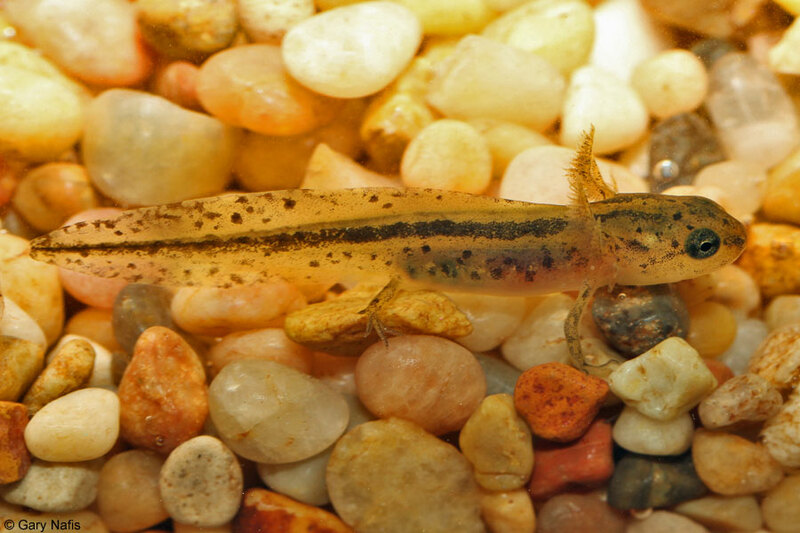 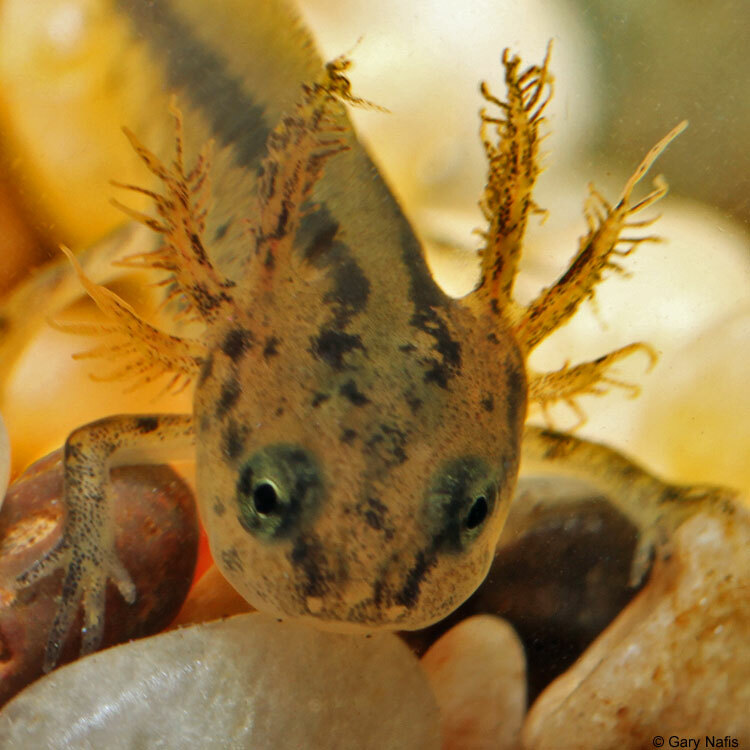 Coast Range Newt Larvae, about an inch in length, swim and crawl around underwater in a small aquarium.